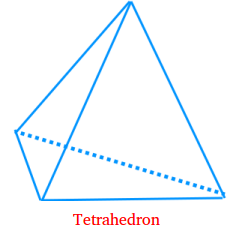 What is a tetrahedron ? Definition and examples. A tetrahedron, also called triangular pyramid, is a space figure with exactly four triangular faces. Notice that a tetrahedron has four faces, four vertices and six edges. If all the triangular faces of a tetrahedron are equilateral triangles, the tetrahedron is called regular tetrahedron.